Mother’s Day Ideas, and Baby Chicks on the Way! This week we have been wrapping up some loose ends. We tested on subtraction on Thursday, and will be starting problem solving on Friday and next week. 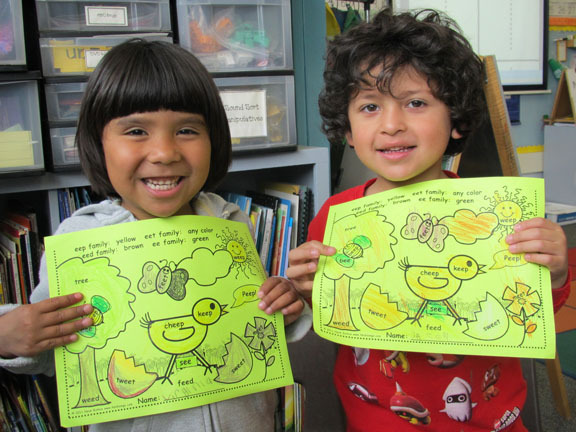 We also have been finishing up our unit on insects, and starting to learn about chicks and other animals that hatch from eggs. Plus, we are getting ready for Mother’s Day, so we have been wrapping our presents and writing cards. So this hopefully will give you some ideas for Mother’s Day if you are trying to figure out what to do with your own class! One thing I would like to point out is that there were GOBS of great ideas offered up on my HeidiSongs Facebook page a week or so ago when I asked people to post their favorite ideas for Mother’s Day projects. So if you don’t find anything you can use in this blog entry, maybe there will be an idea you can use there. In any case, good luck! If you have been following my blog for very long at all, you probably have figured out that I LOVE to do directed drawing with my class! Well, we did a guided drawing of the childrens’ mothers in March to send off to the Makit Company and have them made into plates for Mother’s Day. The plates turned out really cute! On Tuesday, I had a parent volunteer call each child back one at a time to take a look at his or her plate before we wrapped them up. Now the plates will be wrapped in butcher paper, and the children will decorate them with flowers that they will make out of paper. 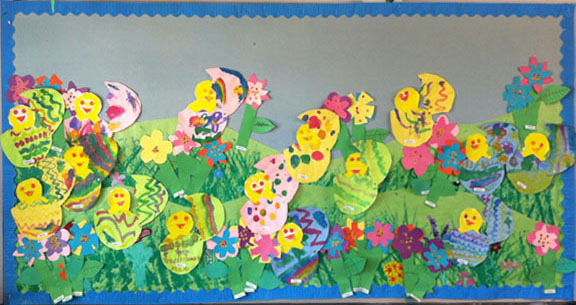 We will be using the patterns for the flowers that I posted on my blog on March 26, 2011. We are also using the same guided drawing instructions to make a card for our mothers, and then will write them a letter on the inside. I am including the instructions for this project as a free download for you this week! If you choose to do this guided drawing project with your students, I have only one important thing to say from experience, something that I seem to forget to do every year: remind the children before you start that this is supposed to be a nice picture of their moms that she will LIKE, and therefore, should NOT be made into a vampire or a monster, since most mom’s wouldn’t appreciate that! There is always SOMEBODY that has to start over. So when you make copies of the cards in preparation, make plenty of extras! I have to say that when the results of a guided drawing project are “important to me,” it kind of takes the fun out of it, because then when the children start adding creative little things here and there that “ruin” the project I find myself getting all stressed out and upset. But that’s the only thing I don’t like about this particular project. On the inside of the Mother’s Day card download, there are lines for the children to write a letter to their moms. To prepare, we’ve been doing lots of brainstorming to help generate ideas for their letters. We also made some sample letters in front of the whole class. When I do this, I take the helper of the day and write as if I am him or her. Then I write the letter in front of the class, letting that child dictate to me what he or she would say. We sound out the words that we don’t know using the Sounds Fun cards to help us spell. 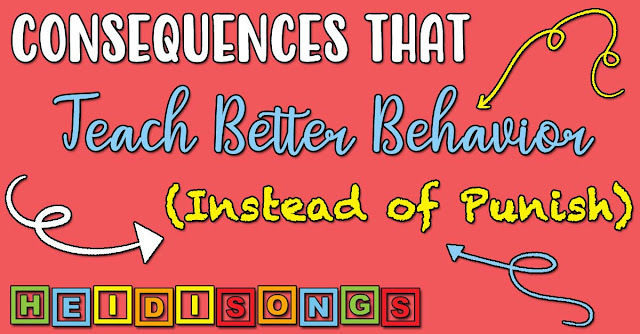 We also use whatever Spelling Songs that come up as needed. A couple of the songs that really help in this situation are the “Dear” song and the “Love” song from Sing & Spell Vol. 4. 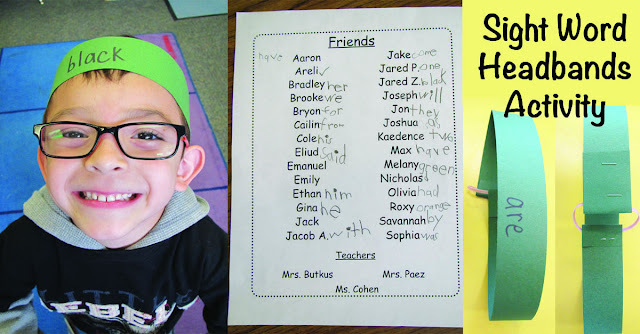 We actually learned them way back in December when we were writing letters to Santa, and many of the faster learning children learned to spell and write the words even that early in the year! If you ask me, the hardest thing to get the children to understand that when you write a letter, you sign YOUR name (not Mom’s!) at the bottom with “Love, ____.” You don’t need to put your name at the top or write “The End” when you are done! It’s kind of amusing when I see the things that they assume will go in a letter, but that’s only because they lack experience with them. And I am really just enjoying their innocence; that’s the fun of teaching little ones, isn’t it? 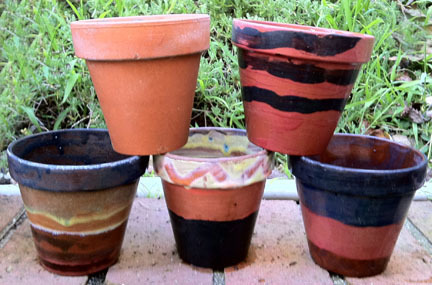 One other thing that we have done in many previous years for Mother’s Day is purchase some of the clay pots that you can find at craft stores or hardware stores, let the children glaze them, and then fire them in our school’s kiln. This was a better deal when the pots would go on sale for fifty cents a piece, but these days even the smaller pots are about seventy-five cents to a dollar each. However, this is still much cheaper than buying the Makit Plates for $5.50 each, if the school is buying the glaze and also has a kiln! I have found that the easiest thing to have children do with the glaze is make stripes of color around the outside of the pot, starting from the top and then working your way down. The colors blend together as they drip, and you get some really neat effects as they mix. I have the kids write their name on a paper towel and place their pot on that. Then when the pots are dry, after school I go back and paint their names on the top rim of the pot with black glaze. We found out the hard way that the ONLY thing that survives in a kiln is glaze, and the pot! Both pencil and permanent marker will get burned right off, so if you rely on that to tell you whose pot belongs to whom, you will be VERY sorry! The only way to do it is to paint the names on with glaze, and that has to be done after the rest of the background glaze dries. It would be cute to have them write their own names, but the rim is such a small space, and paint brushes are so hard to control that I just decided to paint the names on for the children myself. If I had fewer students and could watch over each one individually, I think I could have them write their names on themselves, but NOT with 28 students! It’s wonderful to send the pots home with a flower growing in them, but the moms love the pots just as much if they are empty, I think! We have given them pots to paint with regular acrylic paint before, and had them paint flowers with Q-Tips. That was pretty easy for everyone to manage. They did the stems with a paint brush and the daisies with Q-Tips, and they painted some grass along the bottom. With that project, they didn’t have to be fired at all in a kiln, but the paint doesn’t last “forever” the way a nicely glazed and fired clay pot does. 4. Chicken Eggs in an Incubator- And a Chick Project, Too! We now have a whole “brood” of chickens getting ready to hatch in our classroom incubator! There is a wonderfully nice lady living near our school that keeps chickens, and she always is nice enough to supply us with eggs. I started incubating them on Wednesday, so that means that they should hatch in 21 days. That’s about one week before our Open House, so we should have the excitement of a bunch of little baby chicks in our room on display at Open House. I have hatched chicken eggs for many years in a row, and I am starting to feel like an “old pro” now. (That being said, now just watch NONE of them hatch!!!!!) This year, I ordered a hygrometer so that I can keep close track of the humidity level in the incubator as well as the temperature. 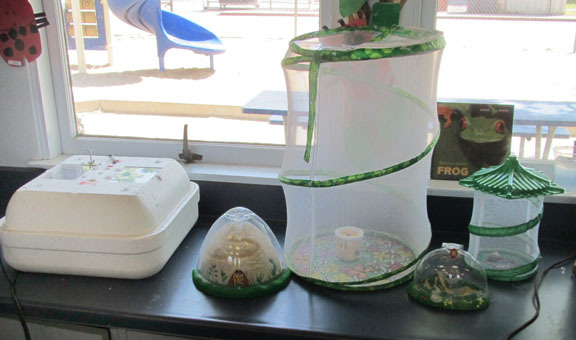 In addition to the eggs in the incubator, my caterpillars and praying mantis egg sack have also arrived, and I am ready for the ants to go into the ant farm. Unfortunately, it seems that ladybug larvae are out of stock all over the country, so we will have to settle for adult ladybugs only this year. Just to celebrate the chicks in the incubator, I am giving you a free download of my Hatching Chick project. Hopefully, it is not too late to make use of it. If you have the children make the egg into a blue robin egg rather than an Easter Egg, than you ought to be able to use the project any time. 5. Long Vowels in Kindergarten? It Could Happen! With the help of our Sounds Fun cards and now songs, too, we are learning to sound out and read words with long vowels in them. I have been making my usual coloring worksheets to help with this, and it really is working out great! I am hoping to find the time this summer to create a whole bunch more of this type of thing. 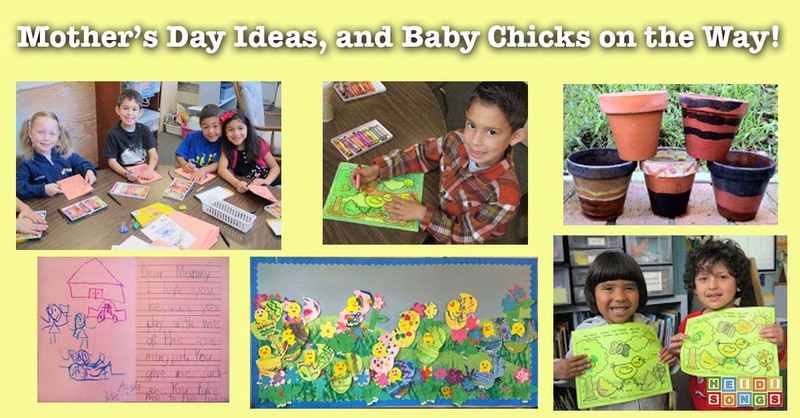 I am giving you a free download of my chick themed worksheet that helped them practice reading long E words today! B. I color in a few of the answers on the worksheet in front of them under the document camera so that everyone knows what to do. But I still sound out ALL of the words with the children and have them tell me orally which word family it belongs to, and therefore what color it should be. C. When we divide into small groups, I have the children begin working on their worksheets. 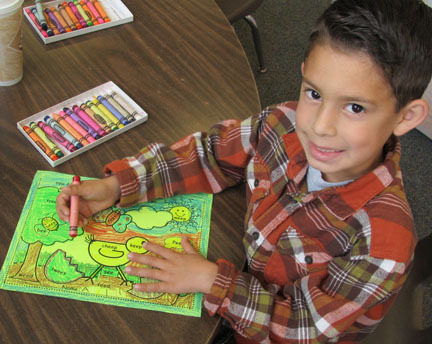 As soon as I sit down, I stop one of the children from coloring and have him or her read all of the words on the paper to me individually. This is really the most important part of the entire lesson, because I am getting a chance to hear each child sound out the words. It is also really the best reason to give the children the worksheet, because it keeps some of them busy while I do this! The rest of the children are in their other centers, so they are busy as well. D. For my groups of struggling learners, I have them do the entire page with me, one word at a time. I have them all find and put their fingers on a specific word, such as the word on the chick’s wing, for example. Then together we all sound out the word and decide what it is. Then we decide what color it should be, and then they all color it. Then we all pick another word and keep going. 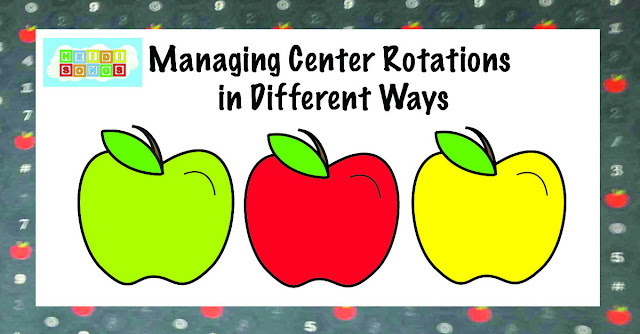 For me, this is the best way to differentiate instruction on an activity like this, because my lower functioning groups cannot possibly do this activity independently. Or maybe I should say that they simply WILL not do this activity independently! I would have to say that a big part of the problem is really not academics, it’s more an ability to focus and a lack of interest in completing the work. Left to their own devices for fifteen minutes, they typically complete very little and tattle quite a lot. But how much of that is their fault, really? 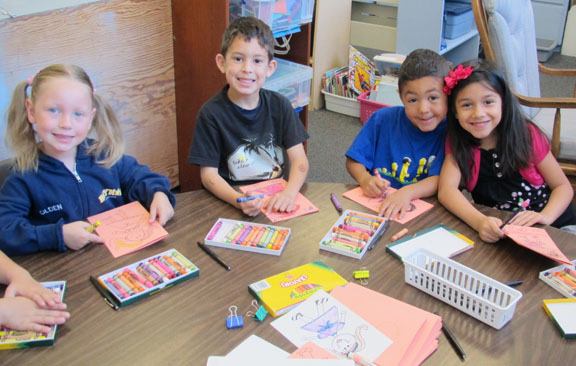 Most of them just turned five years old last fall, and so in my mind, they are victims of the circumstance of the late California entrance date for Kindergarten of December 2. Unfortunately, they are still expected to do just as much as everyone else. And the fact is that they CAN read those words with the long vowels; they simply don’t want to do the work, because they are still “programmed” to play. Thanks for another great set of activities! Although we only have a short time left, your activities still keep the learning fun! You are my secret weapon! Try using 4H as a resource for your egg to chick unit. I have a booklet that shows the embryo development for evey day. We label the parts that are developing. My class is up to more than 15 labels! Our chicks will hatch on Monday and the ducks hatch on Friday. It will be a cheepingly wonderful week in my room! Thanks for all of your resources! Heidi - I LOVE your ideas! 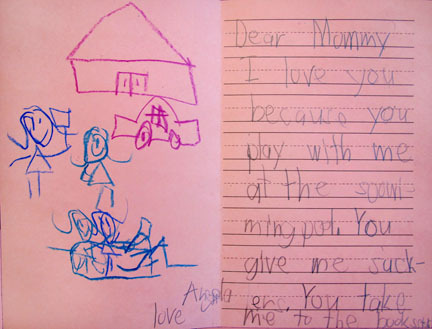 I had the kiddoes in my K/1 combo class create your guided art Mother's Day cards. The lesson was wonderful - the cards were wonderful! Thank you! I feel like I am always scrambling for ideas for special occasions because I don't want to repeat what was done in kinder, but I don't want to step on first grade's toes. Your blog has helped me immensely. Thank you again! Thanks for sharing your activities and providing the printables! Thank you! Seriously, that "I Can't Draw" book is on my VERY LONG to do list! And it has been for a VERY LONG time! One of these days, I'll get it started! But every time I get a lesson finished, I just want to share it, and the book is soooo far away!